Bobby Deen is a television cook, TV personality, and restaurant manager. He is the second son of Paula Deen and with his brother, Jamie, operates her restaurant, The Lady & Sons, in Savannah, Georgia. Bobby has been an essential ingredient in the recipe that has made his mother an American hospitality and cooking icon. The warmth, humanity and kindness that are so much a part of Paula Deen’s persona are really family traits that were passed on to Bobby and his older brother, Jamie. As the family continues to cook, write and effectively welcome the world to sit in the kitchen and be a member of their family, Bobby maintains his own style, interests and passions. After high school, Bobby was the delivery man and an integral part of the now-legendary home business that launched Paula Deen on the road to success. Bobby brought “lunch-and-love-in-a-bag” to the customers and the praise and feedback to Paula. The Bag Lady saved Paula and her two young sons from near homelessness. The business would soon grow into a restaurant, The Lady & Sons. Bobby Deen was in the front of the house and took care of the customers, leaving his mom to craft recipes that gave The Lady & Sons its first national exposure and launched Paula and her family on a trajectory that has made them one of the most recognized and beloved families in America. With The Lady & Sons firmly established, Bobby and Jamie began appearing to rave reviews on their mother’s cooking shows on the Food Network, and then launched their own show on the network, Road Tasted. The success of the program had Bobby and Jamie exploring America in search of more examples of love and warmth-infused cooking, and began to draw younger people and a new audience to the growing number of Deen family fans in America. By mid-2011, the Deen brothers had published four books: The Deen Bros. Cookbook-Recipes From the Road in 2007; Y’all Come Eat, released in 2008; Take It Easy in 2009; and Get Fired Up in 2011. They published four standalone magazines in 2010 and have plans for more in 2011. They’ve expanded their efforts with a line of spices, barbecue sauces and T-shirts. Bobby and Jamie continue to work together, and in 2011 they were again judges in the Beringer Great Steak Challenge. Both also worked with the Grain Foods Foundation by supplying grain-based food recipes to promote a healthy diet. But Bobby, after starting to lift weights, work out and master jujitsu with friends when he turned 30, has developed a new passion. He still loves the traditional foods, but he’s developing healthier versions of some of the family classics because of the changes in his lifestyle that came with his training. He’s still a devoted sports fan, and he still plays the drums, something he started as a kid. Bobby continues to evolve and even picked up acoustic guitar, a craft he’s now devoted to learning. Bobby makes his solo television debut on Cooking Channel in his new series Not My Mama’s Meals, where he develops healthier versions of the traditional foods he grew up on. 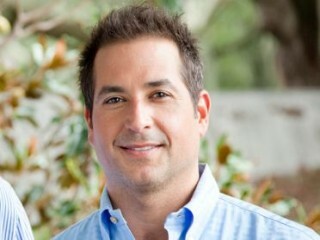 View the full website biography of Bobby Deen.